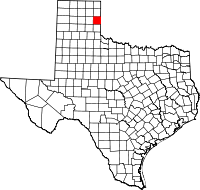 Wheeler County is a county in the U.S. state of Texas. In 2010, 5,410 people lived there. The county seat is Wheeler. The United States Census Bureau says that the county has a total area of 915 square miles (2,370 km2). 915 square miles (2,370 km2) is land and 1.0 square mile (2.6 km2) (0.1%) is water. ↑ "2010 Census Gazetteer Files". United States Census Bureau. August 22, 2012. Retrieved May 12, 2015. This page was last changed on 22 September 2017, at 16:12.